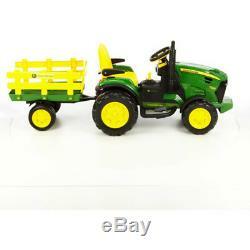 Tractor Ride-On John Deere Ground Force 12V Riding Toys. 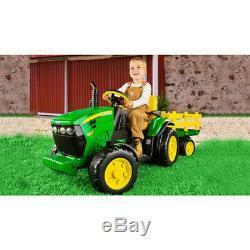 Children will feel all grown up driving the Peg Perego John Deere Ground Force 12-Volt Kids' Tractor Ride-On. Handsomely designed to replicate the real thing, it offers simulated features of the adult models in a kid-sized package. It has knobby, high-traction tires that offer an exciting "off-road" experience and Smart Pedal technology for added safety. This 12-volt ride-on has a powerful rechargeable battery with two front speeds, giving children the ability to travel forward up to 5 mph and 2.5 mph in reverse. Rough, rugged and fun to drive, it travels through tough backyard conditions. Children can climb aboard, grab the wheel, turn on their favorite tunes and rest their arms comfortably. The Peg Perego John Deere Ground Force 12-Volt Kids' Tractor Ride-On includes a large side wagon that can be loaded with toys, a rechargeable 12-volt battery and a charger. 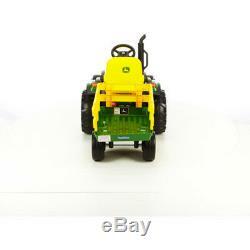 John Deere Ground Force 12-volt Tractor Ride-On by Peg-Perego. 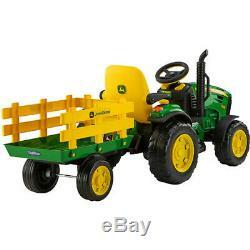 Kids' tractor ride-on looks like a real John Deere tractor. Drives 2.5 and 5 mph. Peg Perego ride-on includes a large side trailer. Adjustable seat with arm rests. Operates on a rechargeable 12-volt battery (included). 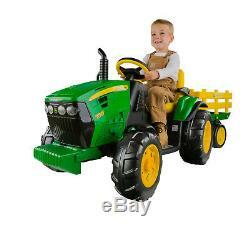 John Deere tractor ride-on includes a battery charger. Dimensions: 26.5 W, 67.5 L, 24.5 H. Run time: 1.5 hrs. Maximum weight capacity: 85 lbs. I hope you like this. 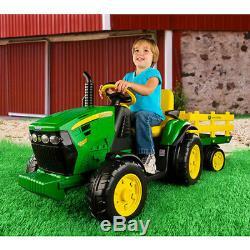 The item "Tractor Ride-On John Deere Ground Force 12V Riding Toys Adjustable Seat Kids" is in sale since Sunday, August 26, 2018. This item is in the category "Toys & Hobbies\Electronic, Battery & Wind-Up\Battery Operated\1990-Now\Ride On Toys & Accessories". The seller is "mb_lingus" and is located in Phoenix, AZ. This item can be shipped to United States.